This Financial Post article discusses the effect of the recent drop in oil prices on oil production in Canada and oil sands production specifically. Prices have been driven by news of slowing growth in China, a weak US jobs report, economic uncertainty in Europe and an easing of tensions in the middle east (other than Syria, of course, which doesn't export much oil anyway). 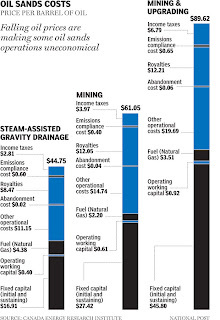 It claims some oil sands projects are now uneconomic. The graph at the top of this article is supposedly derived from the Canadian Energy Research Institute's (CERI's) March cost numbers. I think these numbers have to be taken with a large grain of salt. While costs have been inflating at an alarming rate recently, I still find it hard to believe that a mining operation without upgrading spends $60 a barrel of production. Bitumen was selling for $60 a barrel or less even when WTI was over $100 a barrel, yet the big mines were still making money hand over fist. Maybe a brand new plant being built today would have costs approaching this, but even then it seems high. 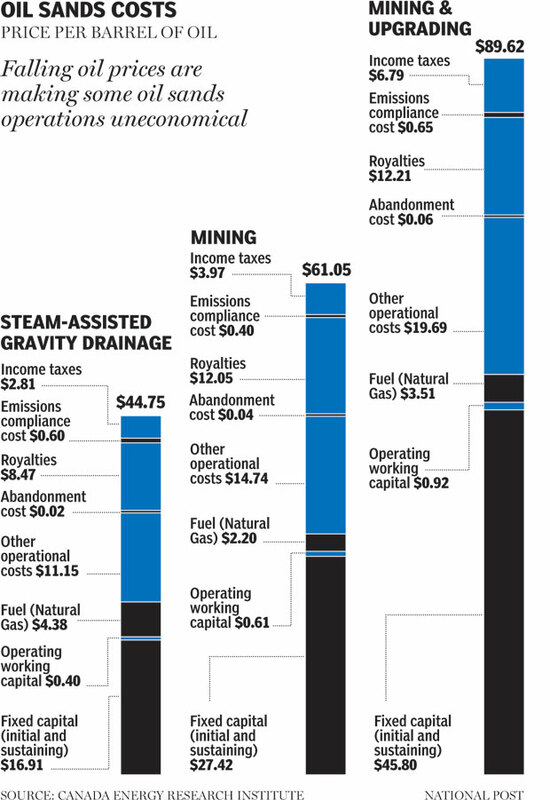 For the SAGD costs of $45 a barrel, I'm sure that's pretty accurate for some projects. But other projects operate for much less, based largely on needing far fewer wells to produce the same amount and having far lower steam oil ratios. MEG Energy, for example, reported operating costs of $7.95 a barrel last quarter, apparently including gas for steam generation. That means operating costs are a bit over half those listed in the chart, helped by selling electricity generated in their co-gen plant. The province apparently ran its economic numbers based on an expected 2012 price of US$99.25 per barrel of WTI, which it is now well under. I don't know what they were thinking when they did this - it seems to me a government looks far better if they are unreasonably conservative than unreasonably optimistic.